The scene that surrounded the Columbus Blue Jackets during Game 4 of their first-round Stanley Cup Playoff series at Nationwide Arena was unfathomable for longtime fans in the area. Here was a team the city could call its own, playing in a state-of-the-art building with a rollicking crowd roaring with every opportunity by the home side. The noise flowed onto the ice surface in waves, the fans screaming for the goal that would extend the series against the Pittsburgh Penguins, the perennial NHL powerhouse and burgeoning rival. The eyes of the hockey world were on the Ohio capital as the pesky Blue Jackets attacked, looking to make the statement that after a 15-year journey they had arrived as a force. Ed Gingher, who runs the city's only AAA youth hockey program, was there that night. He is heavily invested in what the Blue Jackets do because it directly impacts the talent pool available to feed his program; plus he does some work for the franchise. He is devoted to the sport, having played and coached it for much of his life. "I've never heard a building as loud as the one in Columbus during that series," Gingher said. Then, it got louder. The Blue Jackets, down to the last seconds of the game and in danger of trailing the best-of-7 series 3-1, saw the hockey gods reward the patience of a franchise and its fans. Defenseman Jack Johnson, an enemy from his University of Michigan days turned hometown hero upon his trade to Columbus from the Los Angeles Kings, dumped the puck into the Pittsburgh zone with 30 seconds remaining. Columbus trailed 3-2 and had pulled the goalie for an extra attacker. Ryan Johansen, the first-round savior, beat wandering goalie Marc-Andre Fleury to the puck and threaded a pass through three Penguins onto the stick of Brandon Dubinsky, who was imported for just such a moment. Dubinsky flicked his wrists, and the puck beat a diving Fleury across the goal line to tie the game. The dream remained alive for Columbus and came into clearer focus when Nick Foligno scored in the third minute of overtime, delivering the Blue Jackets all the way back from three goals down and turning a likely insurmountable series deficit into a best-of-3 against the star-studded Penguins. Columbus Dispatch reporter Aaron Portzline, an Ohio native who has covered the team since the beginning, was struck almost as much by the behavior of the fans as what was happening on the ice during the comeback. "Just being above the crowd in the press box and looking down on those people, the sheer joy of the win in Game 4 was something that those people had waited so long to witness," Portzline said. "To taste a victory and the way it happened; it felt like a coming of age for the city and the sports fans in the city in that this is what it has felt like for other cities. It made people realize the next level that there is, gave them a taste of it and that the best is yet to come." "I remember looking at the crowd in there and it was so loud in there. But, there were so many people as they were standing and cheering, they were processing. They were sort of trying to grab on to what this meant in the moment. Somewhere in that cheer was an 'Oh my god' moment." 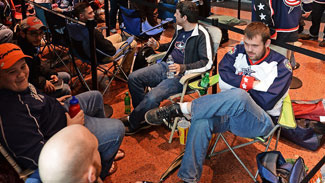 Suddenly, fans were sleeping outside Nationwide Arena to get tickets to Game 6, even after the Blue Jackets lost Game 5 in Pittsburgh. An area of the city once shuttered after 5 p.m. was now the focal point for much of the hockey world. Forward Jared Boll has been with the Blue Jackets since 2007, their longest-tenured member. "Every year, it's seems like the fan base has grown and they've been more excited about the team and hockey in general," he said. "My first few years they were excited to go to the games and have a good time, but now it's grown more into they expect us to do well. "They expect us to play hard and win games. That's the way it should be. They want to see a winning product on the ice and they want to see good hockey. I think that's good for the city." Despite the building belief that the Blue Jackets were on the cusp of something magical, Game 6 did not deliver on the scoreboard. Evgeni Malkin, one of the best players in the world, scored a hat trick to help the Penguins take a four-goal lead, just enough to withstand another furious rally. The Penguins won the game 4-3 and the series 4-2. But the Blue Jackets were far from defeated. The series that played out across 190 miles of Route 70 delivered the Blue Jackets their welcome-to-the-NHL moment and intensified the Pittsburgh-Columbus rivalry. This wasn't the four-and-done playoff series against the Detroit Red Wings from five years earlier. It was instead the moment when the Penguins and many others in the NHL realized that Columbus' hard work during the prior 18 years had paid dividends. Duke Johnson, the general manager of The Ohio State University Ice Rink, also was at Nationwide Arena for the coming-of-age moments last spring. He has been a season-ticket holder since Day One, he said proudly. After the growing pains, losing most of its games for more than a decade, the feeling of standing side-by-side with other fans and holding dear something new and exciting was a high point for Johnson, who began playing hockey back home in Omaha, Neb., and played professionally in Europe before settling at OSU. "The team finally came together and it was a real positive experience to go to the games when we got to the playoffs to play Pittsburgh," Johnson said. "Everybody talked about how exciting that type of hockey is, which was different than it was for years. I think it did help the growth for this year. It's amazing what winning can do. Even if you are not winning, you are competing and you can be really happy. "That's what they did last year. They competed every night last year, and that is what you are looking for." Hockey is hot in Columbus. The Blue Jackets are trying to claw their way out of an early-season tailspin caused by an almost unimaginable number of injuries, and the fans believe it will happen. 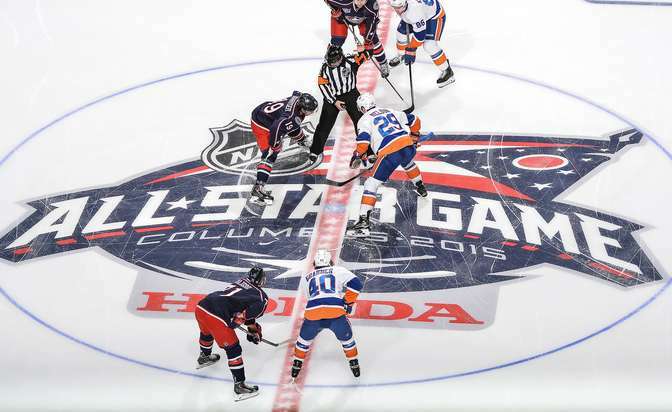 Plus, the 2015 Honda NHL All-Star Game is coming to town. For three days starting Jan. 23, Columbus will again be the focal point of the hockey universe, playing host to the sport's biggest stars and personalities. Columbus can't wait for the opportunity to strut its stuff. Yes, the Ohio State football team, which won the national championship game against Oregon on Monday, is the clear-cut king of the sports mountain in Columbus, but the city is no longer just a college town. It's a hockey town too. "Columbus has forever been a college town," Portzline said. "That's how a lot of people still see Columbus. It's Ohio State, let's not kid ourselves. Columbus is huge, but it doesn't feel it. It was a college town. The world's biggest college town, that's how people saw it; how Columbus saw itself. So, its rivals were Ann Arbor, Bloomington, West Lafayette, State College. "I think with the Blue Jackets, now you are playing Los Angeles, now Pittsburgh hates you, now you are playing the Rangers, Chicago, Toronto, Montreal. It has put Columbus in conversations with cities that it was never in a conversation with. I think it has helped change the mindset of people. It's changed the perspective and the view of the self for a lot of people in Columbus as well." Columbus is a major-league city these days, but the journey has been anything but conventional. Football is king in Columbus, specifically the college brand played by the Buckeyes. There is no denying this. The scenes following the national championship game attest to the power the program holds over the city and much of the state. Hockey could rarely compete. As late as 1991 there were two sheets of ice in Columbus: The Ohio State University Ice Rink and the Ohio State Fairgrounds Coliseum. A string of minor-league teams played at the Coliseum, but few found longevity. The Checkers were first in line, occupying the Coliseum as part of the International Hockey League circuit from 1966 to 1970. In 1971, the Golden Seals took up the IHL mantle and lasted two years, replaced by the Owls, the final attempt at IHL hockey in the city. They lasted four years and relocated after the 1976-77 season. The ECHL arrived in 1991 with the Chill, but the start of a real rebirth was almost 15 years away. Not only was the Coliseum an outdated venue considered by many unable to sustain a professional team, but there was little other hockey infrastructure in the city. Ohio State was its only recreational rink. It ran 22 hours day and hosted college activities, the city's youth program (Capital Amateur Hockey Association), and a four-team adult program. There was one high school with a hockey program: Upper Arlington. Other cities in Ohio were considerably ahead on the hockey curve. Cleveland could bill itself as a former NHL city, home of the Cleveland Barons from 1976-78. The Cleveland Crusaders of the World Hockey Association were a tenant from 1972-76. The Cleveland Lumberjacks of the IHL had a successful nine-year run starting in 1992. At their peak, the Lumberjacks averaged more than 9,000 fans per game. The youth programs in the area were vibrant. Cincinnati had the Stingers in the WHA, multiple entries in the American Hockey League, and the Mohawks in the IHL. 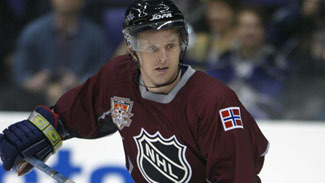 NHL forward Mike Rupp grew up in Parma Heights, Ohio, a suburb of Cleveland. He played youth hockey there, went to the Lumberjacks games, was selected to play in the Ontario Hockey League, and became a first-round selection of the New York Islanders (No. 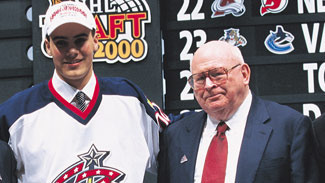 9) in the 1998 NHL Draft. 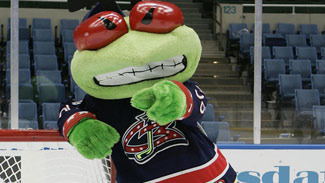 Rupp played 39 games for the Blue Jackets in 2005-06 and enjoyed the experience, but he remembered being highly skeptical when Columbus was awarded a franchise by the NHL in 1997, joining an expansion class that included Nashville, Atlanta and St. Paul, Minn.
"Everyone wondered why it was going there, I think," Rupp said. "People probably thought Cincinnati would be better even though Columbus is obviously the capital. In Cleveland, it was more, 'Why aren't we getting one? We should be the team. We had the team.'" There were a lot of doubters, but a perfect storm was forming in Central Ohio that helped the Blue Jackets hit the ground with some momentum. The latest and greatest of the minor-league teams in Columbus arrived in 1991 with expectations it would go by the wayside like its predecessors. But general manager Dave Paitson was young and energetic. He believed the Chill could beat the odds. Even though Paitson came from the Indiana Pacers of the NBA, where he began his career in sports, he had a bit of a hockey background, having spent three years with the Indianapolis Ice of the IHL. More importantly, he had a marketing background and understood that the Chill could not survive by counting on hockey fans alone. "We went all-out with a slap-people-across-the-face manner," said Paitson, now an associate athletic director at Sam Houston State University. "But people liked it because it was fun and hockey is a great sport when you get in to see it. So we had success where other people hadn't found that formula and, obviously, we did." 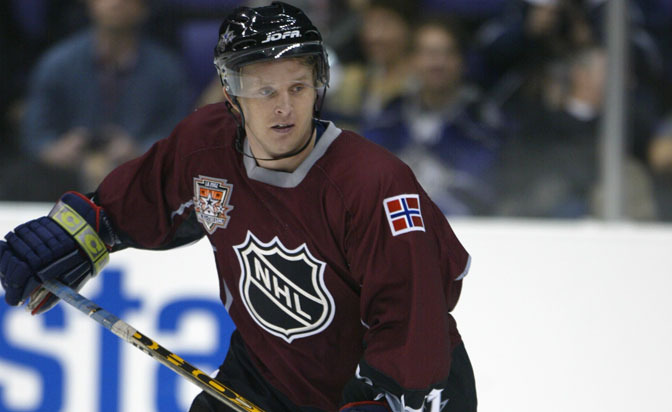 2002 NHL All-Star game in Los Angeles. The Chill became the talk of the town, filling Fairgrounds Coliseum on a regular basis. They drew more than 5,800 fans a game and became a national success story, featured on network news and in major sports publications. "It just caught fire," Paitson said. "That got media attention, and all of a sudden we are getting national media attention. Why? I couldn't tell you. Sometimes you have to be a little fortunate. The timing was right for hockey with that cycle of minor-league hockey. It was a little bit timing, a little bit of need in the city, and a little bit how we approached it. And then people just embraced it." Paitson sells himself and the Chill short in that explanation. The Chill made people embrace hockey and the team. Wacky contests during intermissions and viral marketing before the concept was fully developed assured them of full houses even when the team was not playing its best. Chill games became more than hockey games, they became social events. More than a few non-hockey fans were converted by attending the big-top atmosphere created by Paitson and his assistants. The Chill made an even bigger contribution than raising hockey's profile in a town that cared excessively about college football and more casually about college basketball. "It's Ohio State football first second and third, and then Ohio State basketball, and nothing else matters," Paitson said. "That's the way it was." The Chill thawed out in 1999, playing their last season at the Fairgrounds and drawing fewer than 4,000 fans a game, which was still a good number in the ECHL. But with the Blue Jackets and the NHL on the horizon, the Chill decided to end their eight-year run in Columbus. After a dormant season, they relocated to Reading, Pa. But the Chill established a blueprint that could become the syllabus for a high-level marketing class at Ohio State, and deeper roots that would nourish and stabilize the interest in hockey that was developing in the city and open the door for the Blue Jackets. "It really was a series of dominoes that almost really had to fall in perfect order for things to happen on the timeframe that was there with NHL expansion," Paitson said. "Had we started any later, I don't see how Columbus would have made it in and would have been able to build that groundswell." The Chill's legacy is visible throughout Columbus in the form of ice rinks, which feed a growing demand to play the game. Remember the stats from 1991? Two rinks, the one youth organization, the one high school team, the four adult teams? It's totally different now. The city added 11 rinks in the past 24 years. Five of those have been part of the Chiller franchise, which was started by the Chill soon after it arrived in Columbus. Though there was some altruism in building the first Chiller, in nearby Dublin, the Chill did it out of necessity. With the paucity of available ice time, they were forced to hold early-morning practices during the week, a trend that was not ideal for management and did not endear the organization to its players. "The pitch to our owner was, 'Listen, there isn't anything in the community,'" Paitson said. "There had been rinks here before and they had come and gone too, but I thought if we could manage this right and put it in the right place, we could make that part of the business work the other 22 hours of the day. But we really needed a practice facility. Practicing at 6 a.m. to 7:15 -- that's all the time we had -- was not a great selling point. It wasn't easy and it wasn't enough time on the ice either." The first Chiller was a huge success and others followed every few years: Chiller Easton (1997), which featured a NHL sheet and an Olympic sheet; Chiller Ice Works (2001); and Chiller North (2004). NTPRD Chiller, which opened in 2003, is in nearby Springfield. 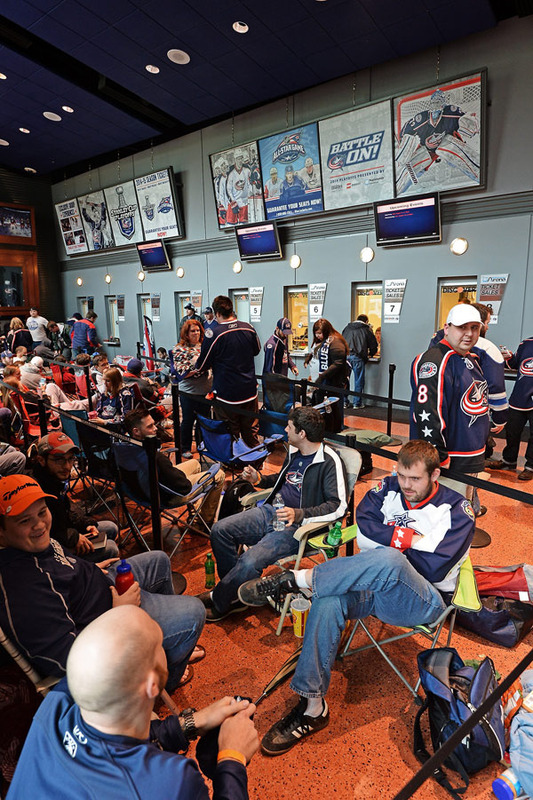 The influx of rinks changed the face of hockey in Columbus. "The one lasting thing [the Chill] left this city that should never be forgotten is it is the Chill who started building rinks, before the NHL arrived, before the NHL said we think we want to be there," Portzline said. "They started building the rinks. All this grass-roots hockey, all these suburban kids saying I want to play hockey that started with the Chill and was pushed to a different level with the Blue Jackets." Gone are the days when the hockey community was cultish, with each participant wearing his or her hockey accoutrements as a badge of honor while trudging toward whatever undesirable ice time was available at the OSU rink. "When you talk about 20 years ago, yes, everybody came through here," said Johnson, the OSU rink manager. "Today, with all the Chillers in town, and they are mostly Chillers, there are a lot of people that don't come here anymore. Being with the university, I have two varsity teams, and our goal is to help the student athlete, so those teams take up quite a bit of time. We don't have much youth hockey anymore here, there's no high school hockey here; it's all gone to the Chillers. Now there are people in town that don't know we are here. That's how much it has changed. "It's bittersweet because you don't meet the same type of people you were meeting before because there are people that have not been here." But the growth in the game and the level of skill being displayed because of the rink-building boom is undeniable. According to numbers collected by the Blue Jackets in a survey about the state of the game in the area, there were 4,500 youth and 2,800 adult registered players in 2012. The Chiller Ice Hockey League is the third-largest USA Hockey registered adult league in the country. More than 2,500 children are in the Junior Jackets Learn to Play Program, which has experienced 15 percent growth since its founding in 2002. There are six youth hockey organizations and 20 high school programs. High-level players in Columbus are starting to get noticed throughout the country, playing for the prestigious National Team Developmental Program run by USA Hockey, showing up at the World Junior Championship, playing in the Canadian Hockey League, and dotting Division 1 college rosters in the United States. Connor Murphy, who came to the Columbus area in 2002 when his dad, Gord, was hired as an assistant coach by the Blue Jackets, spent his formative years in the city's youth system and plays for the Arizona Coyotes after being selected in the first round (No. 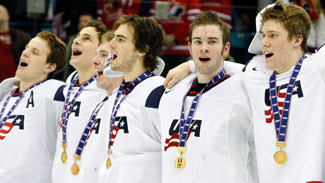 20) of the 2011 NHL Draft. Cole Cassels was drafted by the Vancouver Canucks in the third round (No. 85) in 2013. Like Connor Murphy, Cassels is the son of an NHL player, Andrew Cassels, who relocated to Columbus to work for the Blue Jackets. Forward Sean Kuraly, drafted by the San Jose Sharks in the fifth round (No. 133) in 2011, is having a dominant freshman season with the University of Miami Red Hawks. Others are on the horizon, some playing for the AAA Blue Jackets, a program started in 2004. This season, the U-18 team, made up entirely of players from Ohio, has been ranked as high as No. 3 nationally. Last season, the AAA peewee team won the prestigious Quebec International Pee-Wee Hockey Tournament. "I would say it has been fast-tracked here over the last five to seven years where we have seen great strides in our players as they are taking full advantage of the opportunities that are there," said Gingher, who runs the AAA program. "It's fun to watch." In a week's time, Columbus gets to put its hockey growth in front of fans of the NHL when the All-Star Game comes to Nationwide Arena. The growth of the Blue Jackets, who are again morphing into a team to be respected across the rest of the League after its playoff showing last year and weathering those early-season injuries to key players, will be in the narrative. The hockey infrastructure also will be part of the tale that needs to be told during hockey's midseason gala. But the growth of Columbus as a city and supporter of professional hockey will be perhaps the most evident story of the weekend. The fans who crammed Nationwide Arena last spring proved this is a major-league city that has allowed the Blue Jackets to ease, ever so slightly, the stranglehold enjoyed here by the Ohio State football program. Word is getting out, louder and faster by the day, that hockey is a big part of the fabric. "When I was there for a year, we were terrible and the fans were awesome," said Rupp, who played for six NHL teams. "When I was [with the New Jersey Devils] before Columbus, we could do whatever we wanted and no one would ever recognize us, but in Columbus, people would want to pay for a meal, or when you brought your car in to get serviced, people would be like, 'Oh, I'm a big fan.' It just took me back to being a kid from Ohio and seeing it. These people love it, they just love it. "I would like to see where it can go. I don't think they have tapped that yet. The All-Star Game is a big shot in the arm toward that." R.J. Umberger arrived in Columbus in 2002 from nearby Pittsburgh to play college hockey for OSU. Six years later he was back as a member of the Blue Jackets. He stayed until 2014, when he was traded to the Philadelphia Flyers. He's told all his NHL friends who will be making the trip to Columbus to take part in the All-Star festivities that they are going to be impressed by the city, the citizens, and the passion for the sport. "I told a couple of guys on [the Flyers], [Claude] Giroux and the like, who might be going to the All-Star Game, I said you're going to be blown away how good it's going to be here," Umberger said. "The fans are crazy. You talk about some of the things these fans went through the first 10 years and how passionate they were to stay with the program, the organization those years, it's amazing. "It's really changed since the  playoffs. You go places and people know who you are. Other than Ohio State football, hockey is the big thing here now. People are grabbing onto it. You see it in youth hockey. The youth hockey teams are going all around the country and doing well. People are talking about this area. It's got a lot to do with ex-Blue Jackets guys staying here and ex-Ohio State players staying here and coaching these kids. It's making this place very attractive." Paitson may have had the best seat in town to watch the growth. He arrived as an outsider, selling hockey at a time when it wasn't a prime property and helped grow it into a sport people in the city were ready to consume and embrace, paving the way for the Blue Jackets. He hopes to be back for the All-Star Game on Jan. 25 (5 p.m. ET, NBCSN, CBC, TVA Sports) to experience how far the process has moved along, but if not, he knows he helped author an incredible hockey story. "You look at downtown Columbus today and you think about what it was and what it is today and it is mindboggling really. It's just great. It was what the city needed," Paitson said. "Columbus is such a great sports town. Somebody was going to make something happen there at some point, there's no doubt. "It's too good a town for that not to happen."